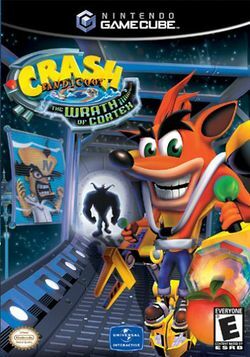 Crash Bandicoot: The Wrath of Cortex is a platform game in the Crash Bandicoot series that was originally released for the PlayStation 2 in 2001 by developer Traveller's Tales and publisher Universal Interactive Studios. It was later ported to the GameCube and Xbox. In 2007 it was included as one of the launch titles for the Xbox Originals service. In 2013 was remastered in high definition, trophy support. Crash Bandicoot: The Wrath of Cortex HD and Spyro: Enter the Dragonfly HD for the first time ever only on PlayStation 3 system. The game was not a commercial success. Many believe this to be the fault of the game's multi-platform release. Previously, Crash Bandicoot games were exclusive on the PlayStation. Fans of the series weren't thrilled that the game was on the Xbox and Nintendo GameCube. In addition, the game was mainly criticized by fans and critics for offering nothing new to the series. Gameplay is basically the same as others in the series, but this time Crash has a new move called sneak. This move allows you to sneak over nitros. Coco is also playable, and for the first time, Coco has her own set of moves. There are many vehicles available including a 4x4, a plane, and a robot suit. GameCube box, front and back. PS2 box, front and back. This page was last edited on 24 February 2013, at 05:04.